John and Becky Durham, RE/MAX Results Realtors join the Hudson Area Chamber of Commerce & Tourism Bureau. With Blake Fry, Hudson Chamber President, Vanessa LaFleur, Hudson Chamber Membership & Programs Assistant, RE/MAX Results Managing Broker Mike Vanderheyden, along with Chamber ambassadors and members. Thank you to all of you for coming and celebrating with us! John and Becky Durham, Hudson Realtors with RE/MAX Results, have joined the Hudson Area Chamber of Commerce & Tourism Bureau. 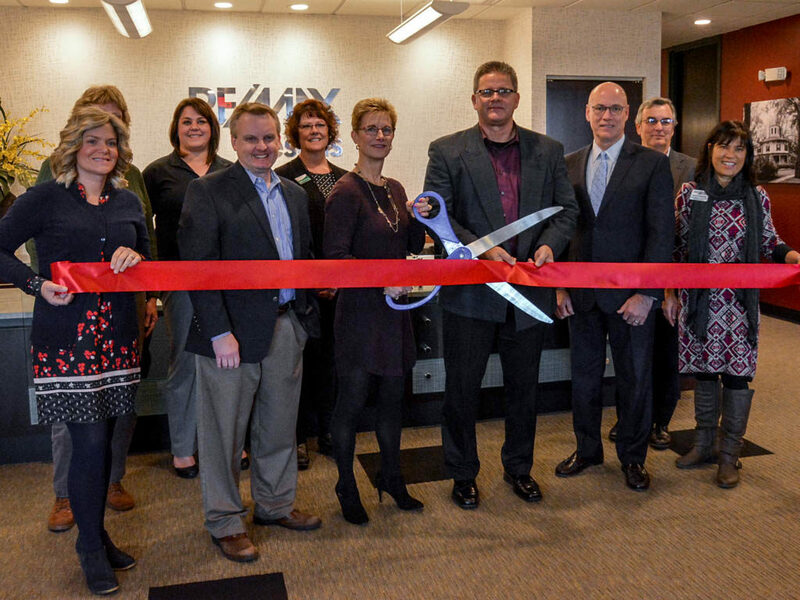 They celebrated today with a ribbon cutting ceremony in the RE/MAX Results offices. Chamber President, Blake Fry, along with Vanessa LaFleur, Membership & Programs Assistant were joined by representatives from the Chamber membership to welcome John and Becky into the Hudson Area Chamber of Commerce. Also present was Mike Vanderheyden, managing broker for the Hudson RE/MAX Results office. Serving their community is important to John and Becky Durham. They are eager to support the Hudson Chamber of Commerce & Tourism Bureau and participate in Chamber of Commerce events. For many Hudson, WI residents, it’s important to choose a real estate agent that lives in Hudson and supports the community. In addition to the Chamber of Commerce, John and Becky serve their community by offering free classes on a variety of real estate topics, including First Time Home Buyers, Seniors Housing Transitions, Baby Boomers ‘Rightsizing’, and more. Click here for a schedule of FREE real estate classes in Hudson!